It’s iPhone season once again and most of us are faced with a tough decision. Should you upgrade or wait around another year for a better device? That may be a tough decision, but it’s always easier to see the pros and cons of both sides with a good old-fashioned comparison. First off, because Apple annually releases an iPhone (or two), a lot of people on a normal 2 year contract with a carrier tend to be one model behind. If you upgraded when the iPhone 5 was released, there’s a good chance you have an upgrade available to use with the iPhone 6 or 6 Plus. But if you went with the iPhone 5s, chances are that you have one year left to be eligible or pay for the device at off-contract pricing. Starting out with specifications, the iPhone 6 features a 4.7-inch display with a resolution of 1,334 x 750 (326 ppi), a dual-core Apple A8 processor clocked at 1.4GHz, 1GB of RAM, an 1,810 mAh battery, and up to 128GB of storage. As for the iPhone 6 Plus, most of the internal specifications (processor/RAM) are the same, but you’ll get a 5.5-inch display (1,920 x 1,080 resolution), optical image stabilization with the rear camera, and a 2,915 mAh battery. In comparison, the iPhone 5s features a 4-inch display with a resolution of 1,136 x 640 (326 ppi), a dual-core Apple A7 processor clocked at 1.3GHz, 1GB of RAM, a 1,570 mAh battery, and up to 64GB of storage. Based on internal specifications alone, there’s a magical difference between the iPhone 6 and iPhone 5s. Also, because the 6 Plus only provides a few benefits, most of this comparison will be based on the iPhone 6 and iPhone 5s. If you’re not a fan of large smartphones, it’s likely that you won’t appreciate the size of the 6 Plus. It’s huge. All three devices run iOS 8 (iPhone 5s can be updated to it), which is filled with a good amount of new features to enhance the user experience. Just the update to iOS 8 may be enough to keep some people on the iPhone 5s, but if you’d like to know more about the new features it brings check out our overview article here. 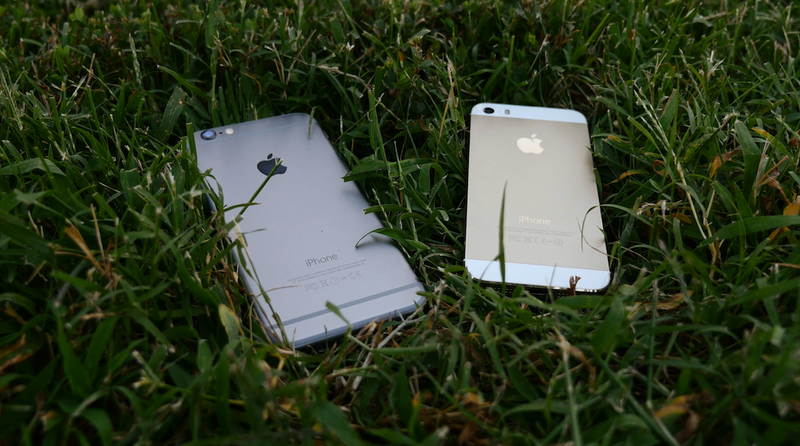 iPhone 6 vs iPhone 5s design. When it comes to design, Apple has taken a very different approach with the iPhone 6. Gone are the chamfered edges that lived on the iPhone 5s and now we’re left with a curved-edge design with a uniform look. The sleep/wake button has been moved from the top to the right side of the device for easy access and the volume buttons have been reshaped to closely resemble what’s found on the 5th generation iPod touch or iPad Air/mini. The iPhone 6 is significantly thinner at 6.9mm, when compared to the 7.6mm found with the iPhone 5s, but it does weigh slightly more at 129g (112g for iPhone 5s). As mentioned above, the iPhone 6 features a 4.7-inch display which looks miles better than the iPhone 5s. Though for some people, the size may be a downside. It’s still a one-handed device in some hands, but when you get into the 4.7 or 5.5-inch region, things tend to get messy. If you’re having trouble using either of Apple’s larger iPhones, there’s a new feature called Reachability that will help you access the top half of the screen. This feature literally moves the user interface halfway down the screen with a double tap (not double press) of the home button. 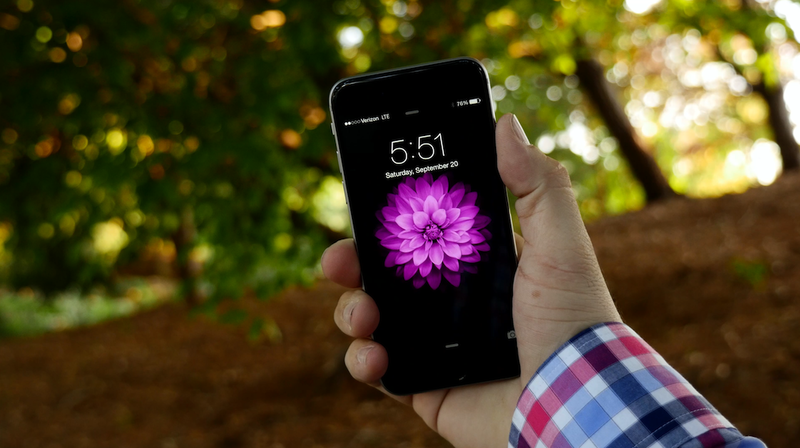 One software feature that’s exclusive to the iPhone 6 Plus is landscape mode. With the 6 Plus, there are specific apps (home screen included) that can go into a landscape mode which functions similar to the iPad. Apps such as Settings, Messages, Notes, and Mail (along with others) have a specific layout that’s designed for the iPhone 6 Plus when in landscape mode. It’s nothing fancy, but a good way to take advantage of some of the extra screen real-estate. Touch ID is also included on the iPhone 6 and 6 Plus as we saw first introduced with the iPhone 5s, but we gain some advantages. With iOS 8, third party apps can access Touch ID for authentication (works with iPhone 5s as well) and thanks to the built-in NFC with the iPhone 6/6 Plus you’ll be able to make purchases using Apple Pay. This feature will require Touch ID to authenticate. Along the front side of these devices, you’ll find the same 1.2-megapixel camera with 720p video recording capabilities. The rear camera has been slightly upgraded on the iPhone 6/6 Plus, but still holds the same 8-megapixel quality as the iPhone 5s; though we are getting Apple’s Focus Pixel technology which makes it much easier to focus during video or photography. The new camera also shoots 1080p video at 30 or 60 frames per second and Slo-Mo 720p video up to 240 frames per second. Speaking of the camera, many were disappointed to find that the iPhone 6/6 Plus has a protruding camera. Because this iPhone is so thin, the camera lens pops right out of the back side (much like the 5th generation iPod touch). It may be a big deal for some, but it won’t affect anything in terms of usability and the camera lens is made of sapphire keeping it safe from scratches. The other alternative is to purchase a case that will level out the back. Apple has also done away with the glass panel design that was first introduced with the iPhone 5. Instead the iPhone 6/6 Plus uses thin plastic antenna lines that run along the top and bottom ends of the back. It’s definitely not a deal breaker, but if you’re not a fan of these new antenna breaks, the space gray model hides them the best. 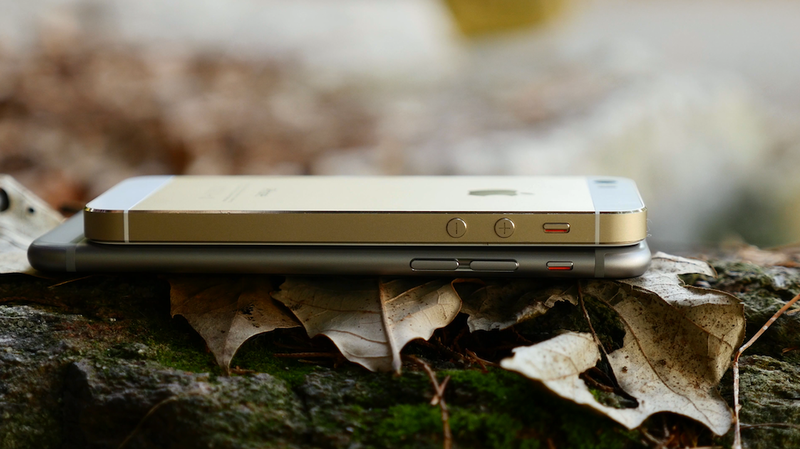 As for overall performance, the iPhone 6/6 Plus is marginally better than the iPhone 5s. The benchmark results speak clearly. Sure, it’s a step up from the iPhone 5, but there’s not a giant performance difference between the A8 and A7 processor. Also, Apple decided to stick with the same 1GB of RAM. That’s not necessarily a bad thing though. These iPhones perform great and there are plenty of reason (mostly design and display size) to upgrade to the iPhone 6. Did Apple bring enough to make it worth the upgrade? That’s obviously a subjective question, but hopefully having the facts will help you answer it. Ultimately, the choice is yours.